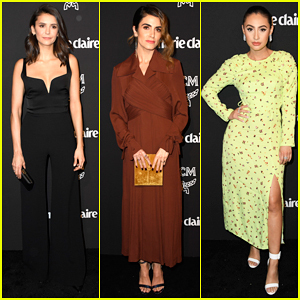 Nina Dobrev & Glen Powell Attend Michael Kors Dinner Honoring Kate Hudson! | Glen Powell, Nina Dobrev | Just Jared Jr.
Nina Dobrev and Glen Powell are honoring Kate Hudson at a special event! The two actors both attended the Michael Kors dinner to honor Kate and the World Food Programme on Wednesday night (November 7), which was held at a private location in Los Angeles. Halston Sage, Aimee Song and Chord Overstreet were also in attendance at the dinner for Kate, who was being honored for her brand new appointment as The World Food Programme Goodwill Ambassador. FYI: Nina wore a Michael Kors cape dress and shoulder satchel. Halston wore a Michael Kors dress and shoulder bag. Glen wore Michael Kors Mens shirt and sport chinos. Aimee wore a Michael Kors dress, belt and sandals.